I grew up in 1950s Brooklyn in a very American home – that is, we knew we were Jews, but we led an American lifestyle. For me, this translated into sports participation. Indeed, I became so good at baseball, America’s favorite pastime that, while in college, I was scouted by the Boston Red Sox and the Pittsburgh Pirates. But that was not to be, as I was a student during a time of turbulence in America, the time of the Vietnam War. I was drafted and called to report for a physical to the induction center at Fort Hamilton in Brooklyn. Many people were trying to get out of the draft back then, but I was taught that “you’ve got to face it,” so I did. And G-d got me out of it. At the end of all the tests, they found that I had a hearing problem – which was total news to me – and I received an exemption. I left the induction center crying with happiness. I realized that I had been saved, which moved me very deeply. Shortly thereafter, I had a strange dream. In that dream, I was in a field, holding a shovel, and I was digging up a gigantic footprint. In that field, there were other people (some of them people I knew) who were doing the same thing – also digging up their footprints. At some point in the dream, I saw an open book which read, “King Solomon had deep faith.” And then I looked up to the sky and heard a voice from on high saying, “There is going to be a resurrection of the dead,” and I turned to see millions of graves. When I woke up, I was very moved by this dream, but I didn’t know what it meant. This happened at the beginning of my journey toward Torah observance. I found like-minded friends and, at one point, six of us decided to put on tzitzit, the fringed four-cornered garments that observant Jewish men wear all the time. We looked in the yellow pages and found a shop – Hecht’s Bookstore on Coney Island Avenue – that sold tzitzit. This is how I came to know the owner of that shop, Sholom Hecht. When I told him that I wanted to learn in yeshivah, he referred me to his brother, Rabbi J.J. Hecht, an important personage in Chabad-Lubavitch, who in turn referred me to Rabbi Yisroel Jacobson, the founder of Hadar HaTorah Yeshivah. Rabbi Jacobson accepted me into his yeshivah, where I went on to learn and where – in 1971 – I also met the Lubavitcher Rebbe. This occurred on the occasion of my birthday – in a private audience called a yechidut – when I also decided to relate my strange dream to him and ask for his interpretation. In preparation for that audience, I did all the things a chasid is supposed to do: I immersed myself in the mikveh; I put on a suit jacket; I wrapped myself with a gartel, the long cloth belt that chasidim wear; and I wrote out my blessing requests in a letter, which also contained an account of my dream. I remember that when I faced the Rebbe, I was trembling – my heart was beating fast and my whole body was shaking. But the Rebbe made me feel at ease, as he presented me with a lengthy interpretation of my dream. I paraphrase what he said to me to the best of my recollection, which I wrote down immediately following the audience. Then the Rebbe paused, looked at me and asked, “Do you understand?” I nodded that I did, and he continued: “The voice you heard was a voice from on high calling your soul back from the dead …” After this, the Rebbe may have said something that I don’t recall, but then he made this remarkable statement: “Every Jew has his own Mashiach within him,” which I understood to mean that in the soul of every Jew there is a spark of Mashiach. He concluded by saying, “You are getting stronger in Yiddishkeit every day. You will have influence over your friends and family … May the Almighty G-d bless you.” When he said that last part – referring to “the Almighty G-d” – I really felt the presence of G-d in that tiny room. The yechidut had lasted eight or maybe ten minutes but it impacted my life immeasurably. There were so many things the Rebbe was right about – I did go on to influence my friends and family. For example, one of my high school friends from my old neighborhood, because of me, went on to embrace his Jewishness, and even enrolled in yeshivah. And my father began putting on tefillin. 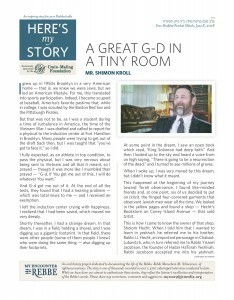 Shimon Kroll lives in Monsey, New York, and has been a life insurance and investment agent since 1979. He was interviewed in January of 2016.